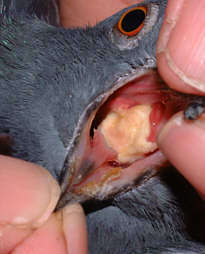 ‘Canker’ is the common term for Trichomoniasis Gallinae of pigeons. It is caused by a flagellate protozoan, not transmittable to humans or other mammals but can be caught by other birds by direct contact. Must be treated, or pigeon will die of starvation, asphyxiation or choking. Often visible as a deep yellow to brownish cheese-like lesion in the mouth or throat, normally towards the back of the mouth rather than near the beak tip. Be aware, however, that it can manifest further into the digestive tract, invisible from examination. Do not try to remove or dislodge canker, as it could cause a fatal bleed! 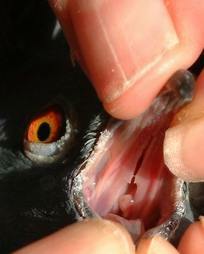 An adult pigeon can be treated with one tablet of Spartrix (Carnidazole) a day for three days running. This can be obtained without prescription in the UK. A youngster or a dove would need half a tablet a day. Metronidazole (0.3 ml per 100gms of pigeon) can be given at the same time in serious cases, but continuing for a further 7 – 11 days (10 to 14 day course). Metronidazole is obtained by prescription from the vet.